"Seven women playwrights write of the struggle for justice in America, where their characters are thrust into an unjust world." The New Press : New York, London. June 1, 2009. Front Lines is a collection of seven brilliant, critically acclaimed plays - each a dazzling dramatic work by a leading contemporary woman playwright. Together they tackle some of the toughest isses of the day - from war and reproductive rights to the crises in our prisons, courts, and public schools - and are by turns provocative, moving, and inspiring. Among the plays is Jessica Blank's riveting and widely heralded The Exonerated (written with Erik Jensen) based on interviews with American prisoners incarcerated for crimes they did not commit. Also included is Nilaja Sun's outstanding No Child..., winner of the Outer Critics Circle's 2007 John Gassner Award for Best New Play - a funny, stirring one-woman play centering on an inner-city teacher's success at involving her rebellious students in their own education by putting on a play. Also featured in the collection are Emily Mann's Mrs. Packard revealing the early struggle for women's rights; Paula Vogel's Hot'n'Throbbing, exosing domestic violence issues; Shirley Lauro's Clarence Darrow's Last Trial about the dominence of white upper-class power in the court room; Quiara Alegria Hude's Elliot, a Soldier's Fugue, centering on the impact of war on a family; and Cindy Cooper's Words of Choice, exploring a woman's right to choose. 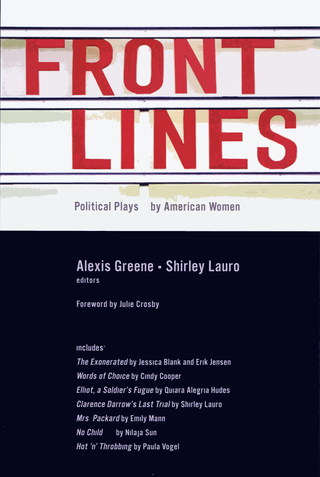 With a preface by distinguished playwright, Shirley Lauro, an introduction by theater critic and historian, Alexis Greene, and a foreword by Julie Crosby, artistic director, the Women's Project, New York City, Front Lines also includes a production photo of each play.